Chairman Kelvin Thomas has revealed that Dean Austin’s impressive spell as caretaker boss was behind the decision to appoint him as the new permanent Cobblers boss on a two-year contract, saying he was the ‘natural choice’ to succeed Jimmy Floyd Hasselbaink. Austin was handed the Town reins following Hasselbaink’s sacking after the 2-0 Easter Monday defeat at Peterborough United, with the situation looking pretty hopeless. The Cobblers needed four wins from their final five games, and after Austin’s first game ended in a 3-0 loss at Blackpool, it looked like mission impossible. But Austin managed to get the players believing in themselves, and victories followed against Bury and Plymouth Argyle to give Town the sniff of a great escape. They travelled to Walsall in the penultimate game of the campaign with their fate in their own hands, but despite dominating the match at the Bescot Stadium, they were beaten 1-0 thanks to a last-gasp goal and the survival dream died. But Thomas was impressed with how Austin galvanised the club on and off the pitch, and he has now given him the chance to take on the top job permanently. “Dean inherited a difficult situation and a squad that lacked confidence but we think he handled things very well and has earned this opportunity,” said Thomas. “He has overseen an improvement in the results and importantly, performances, and really connected the team back with the supporters. Austin has minimal managerial experience, but he has been a first team coach or assistant manager throughout all four divisions of English football over the past 13 years, and Thomas added: “Dean has a good football brain. “He has enjoyed success at all levels of the game, and he is very strong on demanding the highest of standards from his players. 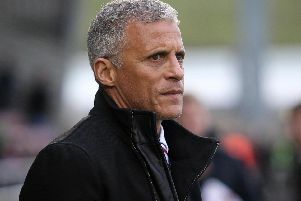 Austin becomes Thomas’s fourth managerial appointment in the space of just two years since the departure of Chris Wilder to Sheffield United in May, 2016. Rob Page, Justin Edinburgh and Hasselbaink have all lasted eight months or fewer in the job, but the Town chairman is confident Austin is the right man to carry the club forward in the future. “We believe Dean can instil a philosophy and a strategy around recruitment and player development that can take us forward,” said Thomas. “We have taken a lot of time over the past few weeks to carry out a detailed process of reviewing our position and where we need to be. “We looked at all the options available and Dean stood out to us as the best candidate for the role. “As well as being able to observe Dean at work at close quarters over the past few weeks, we have also been able to talk about the future and how we want to return to a positive way of playing football. “We have also spoken about how we want to ensure that we have characters in the squad who will give their all for the club and take the game to the opposition. “Dean shares these goals with us and wants to play in this way.